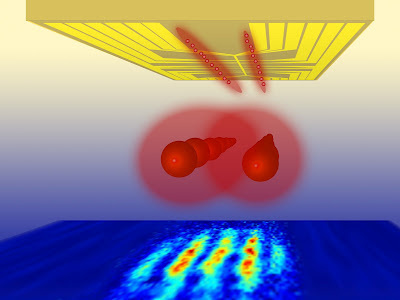 On an atom chip (top), clouds of ultracold atoms (red) are created. They are allowed to interfere, creating an ordered matter-wave interference pattern (bottom). Absolute zero is measured at 0 kelvins. The 3rd law of thermodynamics dictate that it is impossible to cool down an object to exactly 0 kelvins. Since cold is the absence of heat, absolute zero would mean that there is no heat left in the object or system. In 2003, MIT Researchers achieved the lowest temperature which is .45 nK (nano kelvin) or 4.5 x 10-10 K or 0.00000000045 K.
Ultracold atoms are atoms that are maintained at temperatures close to absolute zero. The study that uses ultracold atoms in relation to fundamental quantum phenomena is called Cold Atom Physics. Applications for this technology range from quantum computers, and quantum simulators to ultra-high-precision atomic clocks and quantum metrology. One of the basic underlying phenomenon of cold atom physics is the Boss-Einstein Condensate (BEC). This is a new state of mater that forms in very low temperatures. When atoms are cooled down to very low temperatures, they start to behave in wave like properties, as the temperature keeps going down, they start to merge and behave like one singular wave like particle. This was predicted by Satyendra Nath Bose and Albert Einstein in 1924–25 and was successfully produced and observed in 1995. Every day we observe systems thermalizing: Ice cubes in a pot of hot water will melt and will never remain stable. The molecules of the ice and the molecules of the water will reach thermal equilibrium, ending up at the same temperature. Well-ordered ice crystals turn into a disordered liquid. Experiments at the Vienna Center for Quantum Science and Technology (VCQ) at the Vienna University of Technology have shown that in the quantum world the transition to thermal equilibrium is more interesting and more complicated than assumed so far. Between an ordered initial state and a statistically mixed final state, a so-called "quasi-stationary intermediate state" can emerge. This intermediate state already exhibits some equilibrium like properties, but some of the distinct order of the initial state remains visible for a remarkably long time. This phenomenon is called "pre-thermalization". Pre-thermalization is predicted to play a major role in many different non-equilibrium processes in quantum physics. It could, for example, help us to understand the state of the early universe. "In our experiments we start with a one-dimensional quantum gas of ultracold atoms, a so-called Bose-Einstein condensate, which is then rapidly split into two using an atomchip", Professor Jörg Schmiedmayer (Vienna University of Technology) explains. When the two parts of the condensate are immediately rejoined, they create an ordered matter-wave interference pattern. "The shape of this interference pattern shows us that the two clouds have not yet forgotten that they originally came from the same atom cloud", says Jörg Schmiedmayer. 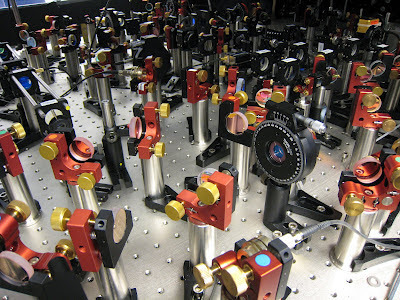 To prepare the ultracold atom cloud, a complicated optical setup is required. After some time, the split atom cloud is expected to tend towards thermal equilibrium. As more time is allowed to pass before the two halves of the system are rejoined, the order seen in the interference patterns decays. "The astonishing thing about this is that the order does not directly reach a minimum. First, it decays rapidly, but then it remains in an intermediate state – the so-called pre-thermalized state", says Michael Gring (Vienna University of Technology). Jörg Schmiedmayer's research group has been working on these experiments for several years. "At first, it was not clear how to interpret this phenomenon. The experiments had to be improved and the corresponding theory needed further development", says Schmiedmayer. In close cooperation with Professor Eugene Demler's theory group at Harvard University the surprising results could now be explained. "The observed disorder in the intermediate state does not depend on the temperature of the initial state. It is introduced into the system by the laws of quantum physics when the atom cloud is split into two", Schmiedmayer says. The transition of systems to thermal equilibrium is important in many fields of quantum physics – after all, a quantum experiment can never be done at exactly zero temperature. Therefore, scientists always have to deal with temperature effects. Carrying out calculations or storing data in a quantum computer inevitably creates non-equilibrium states, which (much like an ice cube in hot water) tends towards a thermal equilibrium, destroying the quantum state. Learning from Ultracold Atom Clouds to Understand the Early Universe? 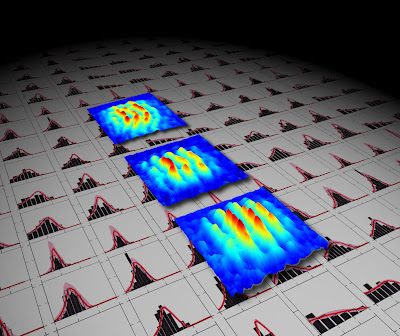 3d representation of interference fringes with red (blue) high (low) atom density. Time increases from bottom to top. At early times, just after splitting the atom clouds, the fringes form straight lines representing high order in the system. As time increases, the fringe shapes become more and more random, representing the loss of information. The novel intermediate state could also be interesting for the physics of quark-gluon plasma. Fractions of a second after the Big Bang, all the matter in the universe was in a non-equilibrium state of quark-gluon plasma. Today, quark-gluon plasma is created in large particle colliders. These plasma experiments showed that certain aspects of the plasma tend towards a thermal equilibrium much faster than one would have assumed. To explain this, "Pre-Thermalization" was postulated in a theoretical framework developed at Heidelberg University. Scientists speculate that this could be linked to an intermediate state, similar to the one discovered in the ultracold atom clouds at the Vienna University of Technology. The processes associated with the decay of a quantum system to thermal equilibrium could also tell us more about the relationship between quantum physics and the classical macroscopic world. "Our atom clouds offer us the possibility to study the fascinating crossover from non-equilibrium states towards thermal equilibrium in detail", says Jörg Schmiedmayer. "That way, we hope to achieve a deeper understanding of non-equilibrium processes, which are omnipresent in nature." For the experiment, a special kind of atom chip was created at the The Center for Micro- and Nanostructures (ZMNS) at the Vienna University of Technology.